The Battle For Iraq Has Been Won. Will The President-elect Preserve The Victory? Yesterday’s vote by the Iraqi cabinet to approve a status of forces agreement confirms what most reasonable people had concluded this summer –that the battle for Iraq is over and the country is stable and secure even though its enemies remain in small enclaves within the country and across the border in Iran. It has taken five years and come at a high cost in American lives lost and in thousands of wounded soldiers, sailors, airmen and Marines. It is, however, a crucial victory in the war against Islamist extremism and for stability in the Middle East. Somebody has to write this. The United States has won the war in Iraq. I’m compelled to proclaim victory because, these days, winning wars has become politically incorrect in Western societies. So much so that some political leaders opposed to the war refuse to recognize the definition of victory or to utter the word. More than five years after the invasion, I still come across people who say they don’t know what victory in Iraq means. That’s on purpose. Feigning ignorance allows them to deny the obvious political and military progress that has been made and continues to be made each day. The truth is, President Bush has been consistent in defining victory. Bottom line, it’s leaving behind a functional and democratic Iraq capable of defending itself from internal and external threats. Iraq is on an irreversible path to meeting those goals. There is no doubt that much work needs to be done in Iraq, particularly in political and cultural reconciliation. But for all the moaning about Parliament’s failure to reach political benchmarks, Iraqis have achieved more political unity in their country than our Congress has in ours. A peaceful and stable Iraq is no longer in question. It’s only a matter of time. So the next time I come across an Iraqi War veteran, I’ll not only thank him or her for their sacrifice in defending my freedom, I’ll also offer congratulations for winning a war. The full article (see the link) outlines many convincing facts about the state of victory in Iraq. The only thing missing is announcing the date of the war’s end. Which this post rectifies. CHICAGO (CBS) — An estimated 125 people were shot and killed over the summer. 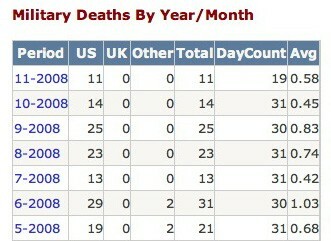 That’s nearly double the number of U.S. soldiers killed in Iraq over the same time period. What more need be said? Of course every death and injury of a U.S. soldier is a tragedy and I would wish to see a long string of zeros on that chart over the upcoming months. But being stationed in a nation and a region that has a long history of hostility to the U.S. and an equally long history of violence means that our troops will always face some danger there. Yet “danger” does not equal “war.” Whatever lingering violence still exists is Iraq is now nothing more than a series of disconnected terrorist attacks, which have become completely ineffectual in changing the hearts and minds of the populace, or re-igniting another civil war. Eighteen months ago, the capital of Iraq worried more about whether it would survive than traffic control. Now that victory over terrorism and sectarian violence has all but arrived, Baghdad has big plans for its future. Iraq needs to fix its sewer and electrical services before attempting anything on this scale, but the plan demonstrates an optimism about the future that has erupted in its capital. They’re already planning a traditional surface-level commuter train to help alleviate car traffic, which has grown overnight into a major headache. Roads and bridges closed due to violence have reopened, and people are once again on the move as Baghdad returns to life. Representative governments have to deliver on their promises. That accounts for at least part of the optimism seen in Iraq, and for the sudden outbreak of big dreaming by Iraqis. They have their future in their own hands for the first time in decades, and the sudden liberation has fueled their imaginations. This, indeed, is what victory looks like. Who gets to decide when it’s over? Indeed, everywhere you look, someone has highlighted yet another detail which, cumulatively, demonstrate that “peace has broken out all over” Iraq. Each person has their own criteria as to when the war was won: Some say we won the war long ago when we defeated the Iraqi Army in three weeks. Some say we won when the Iraqi government tried and executed Saddam Hussein. Some say we won when Iraqis voted democratically to elect their own leaders. Some say we won when we established control over the entirety of the country last year, eliminating the last remaining insurgent strongholds. Some say we won six months ago when the last remaining organized resistance evaporated. On the other hand, there are those who are saying (in response to this essay) that we have not reached that magical benchmark. The Iraqi parliament may have passed the security agreement solidifying Iraq’s post-war stability, but some people say we should wait until the U.S. Senate approves it before we declare victory. Others say that the war won’t be won until casualty levels literally drop to zero. Other say we haven’t won until all troops are gone from the country. Others wait in vain for an official announcement. There is no consensus. And there never will be. Still, the cut-off point between “war” and “not war” has to be drawn somewhere, and if we don’t draw the line ourselves, I guarantee it will NEVER be drawn. Because the Left and the media want to make sure that even ten years from now, when perhaps one US soldier is killed per year in an otherwise completely stable Iraq, that still won’t qualify as “victory.” Because their overarching goal is to to make sure that the war goes down in history as a defeat, no matter what. My opinion is: This is as good a time to declare victory as we’re ever going to get. All signs point to “Yes.” If you don’t agree, that’s perfectly fine, you can ignore this essay. But if you think this is long overdue, then climb on board. If we won, why are there troops still in Iraq? Does our victory mean that I advocate the immediate withdrawal of all troops from Iraq? No. Wars may be won but postwar occupations generally don’t end crisply and cleanly like that. Troops often stay around to rebuild or to maintain the peace for years, even decades. Hell, the United States still has several military bases and many troops “occupying” Japan and Germany who have been there continuously since the end of World War II in 1945. We have two major Air Bases in Korea leftover from the Korean War. The Guantanamo Bay Naval Base in Cuba is a remnant of the Spanish-American War and has been there for over a century; the U.S. military also “occupied” the Philippines at Subic Bay for nearly a hundred years as a result of the Spanish-American War. More recently we continue to have a presence in Bosnia at Tuzla Air Base as a consequence of our role in the Bosnian War of the 1990s. What all this means is that it is standard practice in the aftermath of nearly every overseas war in which the U.S. participates for us to keep some troops there on a permanent or semi-permanent basis. Do I advocate that the domestic government of Iraq continue to assume more and more of a role in its own defense and internal security? Most definitely yes. Do I wish to see U.S. troops going on fewer and fewer patrols and handing over more and more duties to the Iraqi army as time goes by? Yes. Do I wish that there would never be another suicide bombing in Iraq by demented jihadists seeking futilely to destabilize the country? Of course. 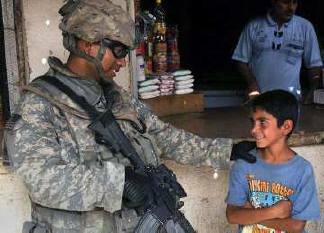 Do I wish that there would never be another act of violence in Iraq? Naturally. But these things take time. So, even though the war is over, American troops are likely to stay on the ground in Iraqi bases in some capacity for quite some time — months, years, possibly even decades if circumstances warrant. But yes, eventually many troops will have to start coming home one way or the other. I am not opposed to an incremental “drawdown” of forces as responsibilities diminish — which has already started to happen under the Bush administration and will likely continue under an Obama administration. What I do oppose is a reckless immediate evacuation of all American troops in Iraq as some sort of political “reward” from Obama to his antiwar supporters. That would send the wrong message to Islamic extremists around the world that the Americans were somehow “driven from Iraq,” which would not actually be the case. Even if we did leave Iraq entirely, it would be in victory, not as a retreat. Since our troops did in fact win the war, they ought to have a victory parade or national celebration upon returning. But I suspect that, as has been happening up until now, the troops will just drift home mostly unannounced and uncelebrated when their “tours” are over. Which is the very reason why we need to declare a Victory in Iraq Day. If the Iraq War is over, why do we still occasionally hear reports of violence or casualties? So, just because there are still occasional suicide bombings (which are becoming rarer and rarer with every passing month) and occasional sniper attacks or IED explosions (also becoming increasingly rare), that doesn’t indicate that “the war is still being fought.” It just means that there are a handful of die-hard extremists who refuse to give up — which is exactly what happens after most wars. The last remaining pro-Saddam, pro-jihad or pro-Iran holdouts in Iraq are no different than any other post-war holdouts, and just because there are still a few left doesn’t mean that the war is still happening, any more than the existence of the Japanese holdouts meant that WWII continued after 1945. Wars end, whether or not every single extremist or die-hard acknowledges it and lays down his weapons. What counts as “being at war”? Many other countries have ongoing issues with rebels, insurgents, guerrillas, or whatever you want to call them; simmering civil unrest. But we do not consider those countries to be at war, even though their situations are not really any different than, and are in some cases even worse than, the situation now in Iraq. Tell me: Do you consider Mexico to be at war? Yet they have an ongoing insurgency by Zapatistas in the state of Chiapas. The Philippines? They’ve been grappling with an Islamic insurgency for decades. Is Thailand at war? Millions of tourists don’t seem to think so, but a violent rebellion by Muslim separatists in the southern provinces sometimes produces more casualties than there are in Iraq. India? They’re not at war — are they? Turkey, Sri Lanka, Colombia: The list could go on and on. In each case, the country in question is not considered to be “at war,” yet it endures simmering insurgencies and/or terrorist violence that in some cases exceeds that now found in Iraq. If these countries are not considered by anyone to be “at war” — which they are not — then neither is Iraq. But where’s the official announcement? Join the VI Day movement! 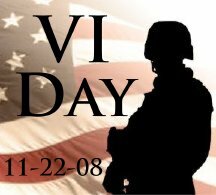 Do you agree with the concept behind VI Day? Then post a VI Day entry on your blog. Once you’ve posted it, email me the link! And I will post a link back to your blog here on this page. Make sure to make at least two different postings: Make one now to announce your support of VI Day and to spread the word ahead of time; and make another one on November 22 itself, to celebrate! One last note: If anyone is planning to hold a “meatspace” (i.e. real world) party or celebration to mark VI Day, send me the details and I will post them here as well. Are you good at creating graphics? Want to participate? This is an open call to all designers and artists who would like to create buttons, banners or other graphics and widgets for people to announce Victory in Iraq Day on their blogs and Web sites. I’m no graphic designer myself, so I’ll post outstanding submissions here for everyone to download. …and anything else you think might be appropriate! I’d like to see banners that say simply “Victory in Iraq,” and others that include the date; and other smaller graphics that could fit on a blog sidebar. You may comment on VI Day here. This entry was posted in US TROOPS, US Veterans, USMC, World War and tagged 2008, Iraq, US TROOPS, VI nov 22, victory, war is won. Bookmark the permalink.